Choosing the Best Battery Backup Sump Pump has significant consequences because the most important attribute you need is reliability. We’ve come up with a wide range of battery backup sump pump’s that we feel are worth your money and won’t let you down when you need them the most. If you’ve ever experienced a flooded basement, you’ll know how important a sump pump can be. But heavy rain and flooding can take out power lines, leaving your sump pump unable to function. The best solution is to install a battery backup sump pump. When the utility power fails, your sump pump will use battery power to keep the water out. This review is going to help you find the best battery backup sump pump. Many people aren’t even aware of what a sump pump is or how it works. How much power do these pumps use, how many hours can a battery backup sump pump work for after the power has gone out? There’s a long list of questions that you may have. This is where the sump pump guide can be a useful resource in helping you find the best battery backup sump pump for your home or business. Without it, you could end up in deep water. After reviewing our selection of the best battery backup sump pumps, I’ll go on to answer all the questions that you may have. I’m sure that, after reading this article, you’ll have no doubts as to which is the best battery backup sump pump for your needs. You’ll know exactly what a sump pump is, how it works, and what to look for when buying a sump pump with battery backup. When choosing the best battery backup sump pump for your basement, you want to be sure that you’re getting the correct product. This review is going to help you achieve this goal. You need to have an idea of what size sump pump you need. This will be relative to the volume of water you need to move and the height to which you’ll be pumping the water, this would be the head. If you have no clue about working this stuff out, don’t worry. You’ll get all the information that you require in the Definitive Sump Pump Guide later in the article. We all have a budget. For some guys spending extra, in the knowledge you’ve bought the very best battery backup sump pump, is the way to go. Not everyone has limitless funds. So, while I’ll be reviewing some of the ultimate (more expensive) battery backup sump pumps, you’ll find some of the best budget battery backup sump pumps too. Whether you’ve got a lot to spend, or looking for a cheap sump pump that’s still good quality and has the reassurance of battery backup, you’re sure to find it here, in this review of the best battery backup sump pumps. 12V DC back up pump moves up to 2900 GPH at 0 feet. “Pre-assembled and pre-plumbed 1/2 HP primary & 12 Volt back-up complete sump system, which includes (2) heavy-duty check valves. Job-ready package saves you time and money, with simple drop-in installation! WAYNE Pumps’ energy efficient motors, and engineered design provide the ultra-quiet experience you won’t believe. The Hardest Working Pumps, You’ll Never Hear™. Look at any site that reviews sump pumps, and you’re likely to see a Wayne pump on the list, usually at the top, or very close to the top of the ratings. Chances are, you’ll find more than one model on any “best of” list for sump pumps. Many in the know, consider Wayne sump pumps to the best. The top of the range models can compete with the very best, and are often cheaper. Their lower models can compete with really cheap sump pumps without sacrificing on quality. When it comes down to it, Wayne sump pumps (battery or not) can easily offer the best value for money in the business. I really like the Wayne WSS30V. In my eyes, this is an exceptional pump at a very reasonable price. With few exceptions, most customer reviews share this opinion. But there have been some issues raised. Though I don’t think that these customer complaints are reason enough to pass this product by. In all fairness, before I rave about the Wayne WSS30V, I should point out the areas where some customers have felt that this is more of a 4-star product, as opposed to 5-stars (which is the rating that most people seem to give it). One guy said that the alarm that warns you when the power fails, and the pump is now on battery backup, was too loud. I can live with this minor inconvenience and many folks would probably appreciate this. You may not always be able to hear an alarm deep down in the basement. There have been some points raised about the design of the float switch which can be a little complicated to install in a tight sump well. The final complaint that I found is one that I do feel needs to be addressed. Though it seems as though the guys at Wayne have corrected this when upgrading this new model. They now advertise an adjustable float switch. The previous generation used a timer for the float switch. I prefer a top level and low level float switch, because it works purely on the water level. The problem with the timer (which cannot be adjusted) is that not all sumps hold the same volume of water. The pump is programmed to run for 20-seconds every time the float switch is activated. If you have a small sump well, it may run dry in less than 20-seconds. This will mean that the pump may continue to run with no water circulating through it – not a good thing. In most cases, this won’t be noticeable. If your sump is not completely empty after 20-seconds of pumping, this will go by unnoticed. Though it’s probably a good idea to check that you order the new generation Wayne WSS30V. Having got the negative news behind us, it’s time for the good news – why people absolutely love this 120V/12V battery backup sump pump. As a DIY guy, I’m very impressed with how easy this pump is to install. It comes completely pre-assembled. You need to connect up two discharge pipes, one for each pump and install the check valves as specified in the instruction manual. This is all very easy to understand. Being a US-made product, the instruction manual is written in English that can actually be understood. Durability is tops. The cast iron pump is protected by a tough epoxy coating. It’s not going to rust and these coatings are almost impossible to scratch. Epoxy (or resin) coatings are way more durable than a standard paint coating. An enclosed battery box is included to house the recommended Wayne WSB1275, 75AH 12V deep cycle battery. The battery is not included and you can use any 12V deep cycle battery, as long as it fits the dimensions of the battery box. It’s important to use a deep cycle battery, also known as leisure or marine batteries. A regular 12V vehicle battery won’t last for this type of application. Using a 75AH, deep cycle battery, you could get around 26-hours of continuous use, depending on how often the pump is activated. There are LED indicator lights that provide you with an instant display of the battery charge status. A smart charger is supplied with the sump pump kit and will automatically recharge the battery once the mains power is restored. The pump is designed to fit into a 15” (or larger) sump basin. The 0.5 HP 120V pump is rated at 5100 gallons per hour with a 0’ head. At the maximum head of 20’, it will pump 2040 gallons per hour and 3840 GPH at a head of 10’. The backup 12V pump is extremely efficient but obviously won’t match the more powerful 120V AC pump. In backup mode (using 12V battery power), the pump can achieve 2900 GPH at a head of 0’. It can handle a head of up to 15’, with a GPH rate of 600. A top suction design prevents the pump from becoming clogged and eliminates air locks. I’ve read several reviews where the Wayne WSS30V is recommended as the best choice. I think I agree. It’s a powerful, very tough, battery backup sump pump. In the realm of best battery backup sump pumps, I find the price to be really great. A superior product at a perfectly reasonable price. They offer a 5-year warranty on this product. Amazon have it as a 3-year warranty but, after checking the manufacturer’s website, I found this to be incorrect. Not only do they offer a fantastic warranty period, but the guys at Wayne are quick to replace or repair a faulty pump under warranty. I’ve read several customer reviews that confirm this. With this kind of support, it’s reassuring to know that you’re buying a quality product from a manufacturer who is serious about customer care. Solid State Air Switch : more reliable than mechanical switches. After checking the price for the Wayne BGSP50 Guardian Premium, some may be left short of breath and a little bewildered. Yes, this is an expensive, very expensive, sump pump. Though this seems to be its only drawback. If this model weren’t so much more expensive than Wayne WSS30V, it would most definitely be my top choice. Once you look past the price tag, it becomes apparent why this is such an expensive pump. It truly is brilliant. If you need the power to move excessive volumes of water, even when the power fails, this is probably going to be your best option. It’s an extremely powerful and, very user friendly, battery backup sump pump. Like so many high-end products, Wayne has introduced Wi-Fi technology to this top model. As we go through the specs, it is abundantly clear why the Wayne BGSP50 is deserving of the title Premium and the price that accompanies this prestigious rating. This is the very latest sump pump technology with electronic functions and design improvements that have set the bar so high, the others will take a while to catch up. The 120V, ½ HP AC (primary pump) has a 5100 GPH flow rate at 0’ head, at a head of 10’, it still pumps a good volume of water – 3480 GPM. The 12V, battery backup pump is (as to be expected) not as powerful. This ¹⁄₇ HP pump is capable of 2040 GPM for a 10’ head. When necessary, provided the mains power is functioning, both pumps will work simultaneously to drain the sump at rapid rate. The combined performance of the two pumps delivers an incredible 6360 GPH at a 0’ head and 4560 GPH at a head of 10’. As you can see, there aren’t many battery backup sump pumps that can match the capabilities of this one. On their website, Wayne claim that the battery pump will remove a whopping 11,000 gallons of water on a single charge of the battery. That’s over a period of about 6-hours of continuous running. This run time may not look as impressive as the cheaper Wayne sump pump, but you’re pumping a lot more water over a shorter time period. So your pump doesn’t need to run too long in order to remove the water from your basement. While the performance of this sump pump is great, there are others that can match, and even beat this. So what makes the Wayne Guardian Premium so special and deserving of its premium price? It’s all about the electronics and increased reliability. Mechanical float switches, used on regular sump pumps, are their weak point. It’s usually this switch that is the first to quit. This leaves the system pretty well useless until the switch is replaced. In a bid to increase reliability, Wayne has replaced the conventional float switch with a solid state air switch, leaving very little to go wrong. Going even further toward achieving total reliability, they’ve provided a dual independent processor. This means full redundancy, if one system fails it is immediately backed up by another. If that weren’t enough, they’ve enclosed the processor in a sealed aluminum shell for ultimate protection and the best operating temperature. They really have left nothing to chance. The Wayne BGSP50 is designed for sump openings of 14’ in diameter and upwards. It’s super easy to install. You basically drop it into the sump well and connect the pipes and power. The entire unit is pre-assembled, and could take as little as 15-minutes to install. They’ve used a 1½” discharge to keep things simple and in line with building codes. A remote control box supplies information on the water level, battery status, and pumping power. Along with this, you have additional functionality through the Wi Fi phone app, available for Apple iOS and Android. When the power fails, the information is sent directly to the app. So if your Wi Fi router is down, the app still works. State of the art technology, designed for ultimate reliability, is always going to cost more. So it should. The Wayne BGSP50 could easily be described as the very best battery backup sump pumpmoney can buy. Apart from robust, well-engineered quality, this pump has the most advanced and reliable electronic controls there is. As you’re paying top dollar for this top product, you can rest assured that you have the backing of reputable brand and a great 5-year warranty. Comes fully assembled and ready to install in your clear water sump. 12 V deep cycle marine battery not included. Zoeller battery recommended but not required to qualify for warranty. See FM1311 for minimum battery requirements. Receive alarms through Z Control Cloud! See FM3010. While the Zoeller Aquanot 508 ProPak53 isn’t exactly cheap, many will breathe a sigh of relief when comparing this to the price of the, quite magnificent, Wayne Guardian Premium. Okay, the Zoeller is not as advanced and perhaps not as durable. No gallon per hour or head specs are provided but, judging by the pump power (½ HP primary and ¹⁄₃ HP battery backup), this sump pump should be able to compete with many of the best when it comes to rapid water removal using either 115V or 12V battery backup. My only complaint would be that the Zoeller Aquanot 508 is a little on the bulky side. You need a sump basin with at least a 16” diameter to accommodate both the primary and backup pumps. I like the generous use of cast iron with a highly durable coating. This appears to be a very well-made sump pump and shouldn’t rust over time. Installation is perfectly easy as the pump comes fully assembled with easy to follow instructions. It comes with a lockable battery box which is large enough to accommodate size 27, 29, and 31 batteries. Note that a deep cycle battery is not included in your purchase. Depending on your choice of battery (and how much water you’re pumping), you can expect between 5½ and 7½ hours of backup time. The Zoeller comes with a good control box which includes warning lights, an alarm, and LCD screen. You can check up on all the important stuff, like battery status, and the control box can be connected to your central alarm or remote warning system. The float switch may be fairly standard in its design, but reliability is improved by using a sealed vertical unit. Generally, this is a very dependable sump pump and customer reviews do confirm this. The controller has a number of protection features to prevent pump burnout and manage the battery charging for optimum battery life. The impeller is also designed to remain clog-free. Though you should keep in mind that sump pumps are not designed to remove large amounts of debris. All things considered, this is a tough, reliable sump pump with good battery backup at a reasonable price. General quality is on a par with some of the very best and it has a good level of sophisticated electronic automation and system protection. System is fully automatic converting DC battery power to AC power. The most remarkable thing about the ECO-FLO E130V6 is that it uses only one pump. Unlike all the others that have both a 120V AC pump and a 12V DC backup pump, ECO-FLO have chosen a more practical approach. At least, I think it’s a better way of doing things. When the power fails, you’ll be using the same 120V pump (with the same power) as you would when the mains power is functional. This system uses an inverter / charger to supply AC power from the 12V battery to run the pump. When the mains power returns, the same unit will automatically charge the battery. The benefit of this system is that it isn’t as bulky as it would be, using two pumps. This means it can fit into a sump basin with only an 11” diameter. You also aren’t sacrificing any power when using the backup function. So, unlike backup systems that use a 12V pump, this one will deliver the same GPH rate whether the utility power is working or not. This is a very common sense approach and I’m quite familiar with ECO inverters, they can handle this type of load with ease. Though it’s not all good news, as this is not a particularly powerful pump at the best of times. With a 0.3 HP pump, it may be more powerful than most 12V DC sump pumps. But it doesn’t match the 0.5 HP AC pump that is probably the most common size for a pump that operates off mains power. So you have improved pumping capabilities when the mains goes down, but not quite as much under normal conditions. You end up with 2700 GPH at 0’ head and, at the maximum rated 20’ head, it will move 600 gallons per hour. Apart from the reduced AC pumping capacity (and increased backup pumping capacity), there’s not much to separate this model from most of the sump pumps that we’ve looked at in this review. There’s no need for a separate control box. The inverter charger operates much like a conventional UPS. It will regulate the AC power output to the pump and automatically charge battery, preventing overcharging. All the system information is displayed on an LCD screen fitted to the inverter power supply. While the ECO-FLO E130V6 isn’t that expensive, there are cheaper units with better capabilities and these pumps could, possibly, be better for heavy-duty work. This may leave you wondering what the benefit is to buying this backup sump pump. It really comes down to its compact size and minimal installation. There aren’t many battery backup sump pumps that can fit into an 11” drain and that is what this model has been specifically designed for. It is a compact solution for limited space. This also means that it’s not expected to pump large volumes of water. This is a light to medium duty home sump pump with a specific purpose. If used for the correct application, it’s the perfect solution for small sump drains. If you have a 15” sump basin, the benefits of this pump kind of fall by the wayside and you could find a more cost-effective solution. When it comes to DIY installation, nothing can be easier. Because this system only uses one pump, there’s only one pipe to connect and no check valves. The battery connects directly to the power supply unit (inverter-charger), and this plugs into a standard 120V household power socket. Nothing could be simpler. We absolutely had to include the ECO-FLO E130V6 in this review of the best battery backup sump pumps. The reason being, this is one of the few that can fit into a small sump basin. As a brand, I consider ECO to be great for home use and light commercial applications. I would never consider this to be a heavy-duty product. It has a specific purpose and, for that, it’s brilliant. If you have a basement that doesn’t collect much water and it has a limited sump basin diameter, this is the backup sump pump for you. One of the Best Battery Back-Up Emergency Sump Pump Systems for your peace of mind. Ready to connect to 1.5″ discharge. Fully assembled compact float switch. ✓ View or download the INSTALLATION MANUAL or the SPEC SHEET for the Liberty Pumps PC457-441. The Liberty PC457 is one of the best 0.5 HP, 115V AC pumps when looking at durability. I say this mostly because of the powder coated aluminum pump housing with very deep cooling fins. This is a clear indication that this pump is made to last. Aluminum is quite a lot more expensive than iron or steel. So when a manufacturer uses aluminum for their pump, you can be sure that they rate quality above cost. In the end, aluminum doesn’t rust like iron and it is the best for cooling. This makes any aluminum pump the best in its class. They’ve combined this fantastic pump with their 441, 12V DC pump to act as a backup during an outage, or when the main pump fails. While the AC pump is certainly one of the best, this 12V DC pump is can be compared to most others. It’s a good pump, but the higher than average price for this combo is mostly related to the aluminum primary pump. That’s where the Liberty PC457-441 is a real winner, in my opinion. When it comes to performance, the Liberty PC457-441 doesn’t match up to the Wayne WSS30V, which is a fair deal cheaper. The Liberty use a more durable AC pump, but I certainly wouldn’t call the Wayne a piece of junk. Leaving the Wayne WSS30V as first choice. If you don’t mind losing a little of your pumping power for a superbly built aluminum pump (which is going to cost more), then the Liberty PC457-441 should appeal to you. The 115V, ½ HP, AC primary pump has a maximum flow rate of 52 GPM (3120 GPH), the maximum head is quite impressive at 23-feet. Though I’m sure you’re not going to get many gallons per hour at this head – no GPH specs are given for the maximum head. Though few basements are even 10’ below the ground, let alone 23’. The 12V DC (441) pump has a maximum 52 GPM (2640 GPH). While these figures are perfectly acceptable, they’re not the best. The system is supplied with the necessary check valves and a battery box. It is also equipped with a battery micro-charger with LED indicator lights, as well as overload and overheat protection. Though it seems like the control box, which features audible and visible alarms (amongst other things), is sold separately. This is not essential to using the pump, it’s more of an extra convenience. This pump combo is as easy to install as any of the other AC/DC pump combos and fit’s a sump opening of 15” and upwards. Like I said in the introduction, the Liberty Pumps PC457 is probably one of the most durable pumps built for domestic use. In conjunction with the 441, 12V DC backup pump, it makes for a dual backup system that can compare favorably to any in this review. It may not have the most impressive GPH spec, but it’s not far behind the best battery backup sump pumps. In the end, you’re paying a little extra for what appears to be one of the best AC pumps and it carries a 2-year warranty. Best Battery Back-Up Sump Pump that consistently monitors the health of your system. No monitoring fees. If there’s a problem, you’ll be sent texts and emails to let you know. The only system that constantly checks your main sump pump! 24/7 Remote Monitoring. PumpSpy’s servers constantly watch over your sump pumps automatically and instantly detects problems before flooding can occur! Monitors your main sump pump. The only system that constantly checks your main sump pump! Automatic backup pump. In the event of a main sump pump problem or power outage, PumpSpy automatically activates the battery back-up pump. Notifications and alerts. When a problem happens, PumpSpy sends you instant alerts via text message, email and PumpSpy App. Reliable and durable. Quality automotive grade components are sealed in waterproof epoxy to prevent corrosion and increase longevity. Complete system tests 3X a week. PumpSpy makes sure your backup pump and battery are in top working order! Warnings and alarms. Sends alerts and sounds alarms when necessary for your main sump pump, backup pump and battery charge. Longest warranty. Only PumpSpy offers a 3 year, full replacement warranty. So far, we’ve reviewed battery backup pumps that include a primary pump. Many of you may want to buy only the backup pump, as you may well have the primary (AC) pump already installed. There are a number of DC backup pumps that you can buy that don’t form part of a full kit. The Liberty 441 is one of these. Though the PumpSpy PS1000 is probably the best system for backup only, it can work in conjunction with any existing sump pump, as long as your sump basin can accommodate both pumps. Looking at the brand name, one may wonder: Is this the James Bond of battery backup sump pumps? That may be pushing the boundaries a bit, but it has some high-end technology that does put it in a league of its own. So far, the only battery backup sump pump in this review to feature remote monitoring has been the Wayne BGSP50 Guardian Premium. The Wayne uses a phone app that can be used anywhere, any time to keep you on top your sump pump situation. PumpSpy takes this concept to a whole new level. You can use an app for this system, but it’s also monitored by a remote computer, using a GPRS signal that functions even when the mains power is down. This is a free service (there’s no monthly or annual subscription). Should there be any problem with your sump pump system, you will be notified by email or a text message. You can also use the app (iOS or Android) to check up on your system, or receive warnings, at any time. The remote monitoring service includes an automatic system check three times a week. It’s reassuring to know that your battery backup sump pump system is fully monitored for you. It can happen so easily, that you detect a problem with your sump pump only once the rains have come and the basement is flooded. We don’t always think to check the system and I doubt many will do this three times every week. The PumpSpy system takes quite a weight off your shoulders. Apart from the unique monitoring system, the PumpSpy PS1000 utilizes a very impressive 12V DC pump. At a head of 5’, it will pump 2990 gallons of water per hour. At 15’, this is still good – 1625 GPH. It’s an energy efficient pump and will run continuously for 5½ hours. Cycling every 5-minutes, the battery can last as long as 166 hours. A 75AH deep cycle battery should be able to pump 13,000 gallons of water to a head of 10’ on a single charge. The kit includes the powerful 12V DC backup sump pump, a battery box, and the control box. This system will charge the battery and keep it in optimum condition. It will also display critical information using LED indicator lights and an LCD screen. It will constantly communicate with the remote PumpSpy computer and regularly run system tests for you. Instantly detects problems before flooding can occur! If you think that this kit doesn’t include a primary AC pump, it may seem to be quite expensive. I’d say that the 12V pump supplied with the system is one of the best in terms of performance. So that can account for some of the high price tag. Though I’d think the main advantage to this system, which is the largest added value, would be the remote monitoring for life, free of charge. You can’t really put a price on this kind of peace of mind. Most of us don’t really take the time to check all the equipment around the home as often as we should. So having a backup sump pump system that checks itself is priceless. I don’t find it all that surprising that this product got a 4.9 star average customer rating on Amazon. That’s just about full marks and is seldom seen. Then again, this is a truly unique product. It really makes a difference to the way we view backup technology for sump pumps. Any building that has an elevation below ground level needs some way of removing water from this area. A basement cannot drain water naturally, so a sump pump is an absolute necessity. Without it, a basement will quickly become flooded, causing damage to your possessions and, possibly, thousands of dollars in repair bills to your home. If you are not too knowledgeable about sump pumps, this guide is going to explain everything you need to know. Form a basic definition to what a sump pump is, all the way to installation and the details pertaining to battery backup sump pumps. I’ll be giving you the low down on these valuable household safety devices. Because a basement cannot naturally drain itself, runoff water can easily accumulate. Water may also seep into the basement from external drainage, the water table and, sometimes, even the drains inside the home. Being the lowest point of the home, all excess water will eventually make its way to the basement. To prevent the basement from flooding, a sump is built. This is a small basin that is situated below the floor level of the basement. All water that collects in the basement will naturally flow into the sump. In order to remove this water from the sump basin a sump pump is used to lift the water out of the basement sump to a place where it can drain naturally and safely. There are two types of sump pumps that can be installed. A pedestal pump is the most durable, but not the most practical. These pumps use an electric motor positioned above the sump basin. A shaft is used to drive the pump in the sump basin. This allows for easier access for maintenance, but the motor occupies space in the basement which is not always practical. A pedestal sump pump cannot handle debris that collects in the sump basin. Although less durable, submersible sump pumps are the preferred choice for homeowners. These pumps, and their electric motors, are completely sealed and the entire unit fits into the sump basin. Because the pump is sealed and cannot be opened, there isn’t much repairs that can be conducted and these pumps require no maintenance. This also means that they typically last about half the expected lifetime of a pedestal pump. A submersible sump pump has a life expectancy of about 5 – 10 years. A benefit to using a submersible sump pump is that it can handle a fair amount of debris, though some may be better than others in this regard. Because a sump pump is so essential, it needs to function at all times. During a power outage, or when the sump pump fails, water will continue to collect in the basement. The best way to keep a basement free from flooding during a power outage is to use a battery backup sump pump. When there is no utility power supply to the home, a conventional (AC) sump pump ceases to be of any use, it relies on the mains power. When this happens, a 12V battery is used to power an emergency (backup) sump pump that will continue to remove water from the basement when the power (or primary pump) fails. These systems will have a control box that will switch the system to a battery pump immediately after the primary pump is rendered incapable. It will use the battery pump for as long as necessary, or until the battery has run low and can no longer supply the necessary power. A battery backup sump pump uses a deep cycle battery, usually 75 – 100AH. Most battery sump pumps are able to run continuously for 5 – 6 hours. Since these pumps generally cycle, switching on and off as required, the actual backup time from the battery can be several days. It will depend entirely on how much water needs to be removed from the basement, as to how long the battery will remain functional. Obviously, a larger battery with a higher AH rating will provide the best backup time. Once the power is restored, the controller will automatically charge the battery. The best battery backup sump pumps have sophisticated controllers that monitor the battery and ensure that is not overcharged. These controllers will usually provide the user with important information, like the battery charge status, allowing you to determine how much backup time is remaining. They will often have audible and visible alarms (by means of a speaker and LCD display), this will warn the homeowner when the power has failed and the backup pump is now in use. They will usually have a low battery warning and may also have a flood warning. Some may have remote warning and monitoring via a Wi Fi, Blue Tooth, or GPRS communication system. A primary sump that runs directly off the mains power will usually have a 0.5 HP electric motor (373W or 3.2A at 115V). They are typically 110V – 120V pumps and run on standard household power. If the pump cycles every 5 minutes, and pumps for an average of 3 minutes, it consume 6 – 7 kilowatt hours of electricity over a 24-hour period. There’s no telling exactly how the pump will cycle, that depends on the water volume in the basement at any given time. This power consumption figure is merely an indication of how many watts of electricity the pump could use on average. In individual circumstances, a sump pump can use slightly more or less electricity. A battery backup sump pump is never as powerful as the primary pump that uses utility power. Generally, these pumps would use about 30 – 50% of the power that the primary pump uses. Because the DC pumps are more efficient than AC pumps, they will pump more water relative to the power that they consume, but this will always be lower than the primary pump. Depending on the charge controller and the size battery being used, it can take anything from 6 – 8 hours to recharge the battery completely after being fully discharged. Do you really need a battery backup sump pump? If you have an automatic backup power supply to your home (like a standby generator), then you probably don’t need a battery-powered sump pump. In all other situations, I’d say that a battery backup sump pump is essential. Even if you have the best standby generator, it can be advisable to install a battery backup sump pump. You’ll see why in this section of the article. 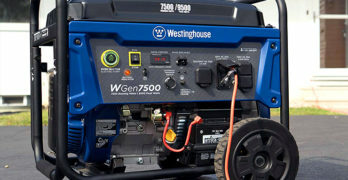 Many homeowners use a portable generator to supply emergency power to their homes. This is fine if you’re at home when the power fails and are able to start the generator and connect it to your essential household circuits. If you’re not at home, you can’t do this and a regular (AC) sump pump will not function. It’s obviously safer to have an automatic battery backup for your sump pump that will immediately switch over to battery backup, even when you’re not home or asleep. A backup generator uses an automatic transfer switch and will start as soon as it detects a mains failure. However, this will be no consolation if your primary pump breaks down. If you rely heavily on your sump pump, it may be advisable to install a battery backup sump pump for these situations. Battery backup sump pump kits are designed for easy DIY installation. But you need to be aware of local regulations and it would be advisable to either consult a professional installer, or use their services to do the installation for you. One of the main things to consider is the water drainage regulations in your area. In the past, it was common to connect the sump pump drain pipe directly to the main sewage system. However, this places immense strain on municipal sewage systems – especially during heavy rain. For this reason, most local authorities forbid this type of drainage connection. This means that your drainage pipe from the sump pump has to be directed to an area where it can safely dispose of the unwanted water without causing further damage to your foundations or cause flooding to another area. This needs to be carefully considered. Once you’re sure that your water disposal is both legal and won’t hinder your existing infrastructure, there’s one more important factor that you need to consider. Will the battery backup sump pump system fit into your existing sump basin? Generally, these systems use two pumps, a primary AC pump that runs on utility power and a battery backup sump pump. They also require a float switch that activates the pump when the water level reaches a certain point and switches the pump off before the sump runs completely dry. One also needs to accommodate the pipes and control valves. For this, you need a sump basin with a diameter of about 14” – 16”. It also needs to be deep enough so that the pumps remain immersed at all times – approximately 24”. If your sump basin isn’t wide enough to accommodate two pumps, you will need to consider a single pump that uses only AC current (like the ECO-FLO E130V6). Instead of using a 12V backup pump, a system like this uses an inverter to convert the DC 12V battery power into standard 110 – 120V household power. Meaning that a single pump can be used for mains and battery power. The drawback here is that these pumps usually cost more and are not as powerful as most primary AC pumps. They are limited by the amount of current the inverter is able to provide and the feasibility of using the battery for extended periods of time. If you’re going to be installing your battery backup sump pump yourself, here are some useful pointers. As always, read your instruction and installation manual carefully. Each system is different and your sump pump may require special considerations. Always place your battery and control box where they cannot be damaged by water or flooding. Most of these systems include a battery bow which will be splash proof but may not hold up to flooding. The control box contains sensitive electronics and special care must be taken to avoid any moisture contact. Many control boxes used for backup sump pumps are designed to handle a fair amount of residual water, but it’s always better to play it safe and install the box where there is no chance of water damage. A dual system that uses both an AC and 12V DC pump, needs to have two discharge pipes, one for each pump. To prevent water flowing directly from one pump to the other and back into the sump, control valves need to be installed. These are usually supplied as part of the kit. Without these control valves, the water will not be pumped out of the basement. You need ensure that the control valves are installed according to manufacturer specifications. In some, cases there may be a specified distance from the pump, at which these valves can be installed. Once installed check the system. You will need to adjust the float switch to cycle correctly for your sump. Use a bucket to fill the sump and check at what level the pump switches on and when it switches off. Adjust the float switch so that the pump switches on before the sump overflows and switches off just above the water intake on the pump. Test it until you get exactly the right on and off position for your float switch. Finally, switch the main power supply to your primary pump and fill the sump again. The battery pump should now remove the water from the sump. You may want to check your control box at the same time, ensuring that all warning systems are operating as they should. Finally, check that the battery is charging once the main power supply is switched back on. With any sump pump you need to occasionally check that there isn’t too much debris in the sump basin and that all your pipes and fittings are in good condition. When you’re using a battery backup sump pump, there are a few additional maintenance procedures that you should be aware of. This is not time consuming or difficult to do. I’d recommend doing a system check at least once a month in the rainy season. If you have water in your basement all year round, do this every month. All you need do is switch the main supply to your primary pump and check that the battery pump is functioning properly and that all warning systems are working as they should. When you switch the power back on, make sure the battery is charging by checking the control box charge indicator.